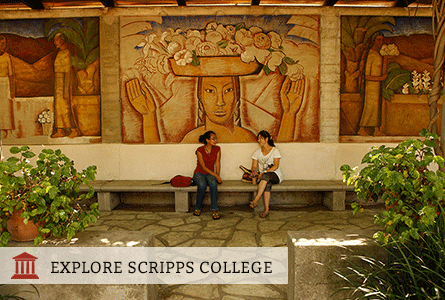 The Scripps QSN Chapter is a small group of about 30 QuestBridge Scholars at Scripps. We hope to provide a supportive community for QuestBridge Scholars on campus, as well as for low-income and first-generation Scripps students who are not officially affiliated with QuestBridge. As an organization, we strive to encourage our membership to graduate successfully from Scripps College by creating a singular place where QuestBridge Scholars—along with their allies— can navigate educational, professional, and personal growth opportunities. We are recognized as an official Scripps CLORG (Club/Organization) and are affiliated with the Scripps Community of Resources & Empowerment office (S.C.O.R.E.) on campus. Our primary QuestBridge contact in the admissions office is Lyanne Dominguez, the Assistant Director of Admissions. We connect with admitted QuestBridge Scholars in the spring before their first year during the DIVE Into Scripps program. We offer a one-on-one mentoring program for first year students, in which they are paired with a current Scripps QuestBridge Scholar to connect with throughout the year. We often collaborate with our neighboring QuestBridge Chapter at Pomona College and attend their events. We hold our own small events in our residence halls’ living rooms (and occasionally the S.C.O.R.E. living room) filled with snacks, friendship, discussions regarding current campus affairs, and stories of how we all personally navigate our college experiences. We encourage you to consider joining our community and the wonderful connections we have to offer!